Instrument Rating HELP! This 220-page review package is designed to help you get through the Instrument Checkride. This package can be used as a self study guide or by flight instructors to provide IPC/Checkride preparation. Designed to fit in your flight bag (Size 6” x 9”). Practical Test Standards - Includes a complete copy of the PTS with sample oral exam questions and sources to find the answer. Maneuvers Guide: Slow Flight - Power Off-Power On Stalls - Steep Turns - Unusual Attitudes - Power Performance Settings - Constant Rate/Airspeed Climbs/Descents - Change of Airspeed - Standard Rate Turns - Practicing Your Skills - Instrument Takeoff - Holding - Recommend Visi-Hold, a visualization template to help you learn hold entries. 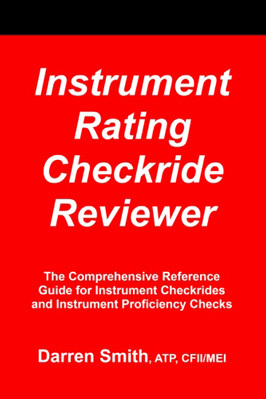 Excellent book for the Instrument student or the CFII...material all well organized and presented. Review: The book is well written. For someone that is working toward getting their IFR certification, this book is a wealth of knowledge. Review: I was surprised at the vast quantity of information found in this book. Everything from radio guides to a complete acronym list is included in a good format. The only drawback is that most of the written advice on various procedures seems to be written in a very patronizing and personal way. I have asked other instructors as well as my own father and uncle (both 737 captains) and they agree that the author goes over the edge a bit with some of the do's and dont's. However, even a student pilot should be able to decide what is good and what to ignore... and this book, is mostly full of good advice and useful tools. Review: If there was an "IFR Pilot Idol" this book won the competition. Lots of gouge, lots of answers, and caught everything my CFII missed. Review: This spot-on guide is a fantastic FAA preparation book. The book covers almost every possible question you could receive during an oral exam. Includes a holding template to help orient yourself and a manoevers guide to help you get started with a safety pilot before paying $50/hr to a pilot instructor. Review: Great prep book - BUT buy it well ahead of when you need it - lots of material. I just finished my checkride (successfully), and both my instructor and I thought this was a great tool. Review: This is the stuff here. My instructor told me if I know the stuff in this book, I'll pass. She was right on. I love the 'lay flat' format of this book. Cons: I wish there was a Commercial Pilot version! !